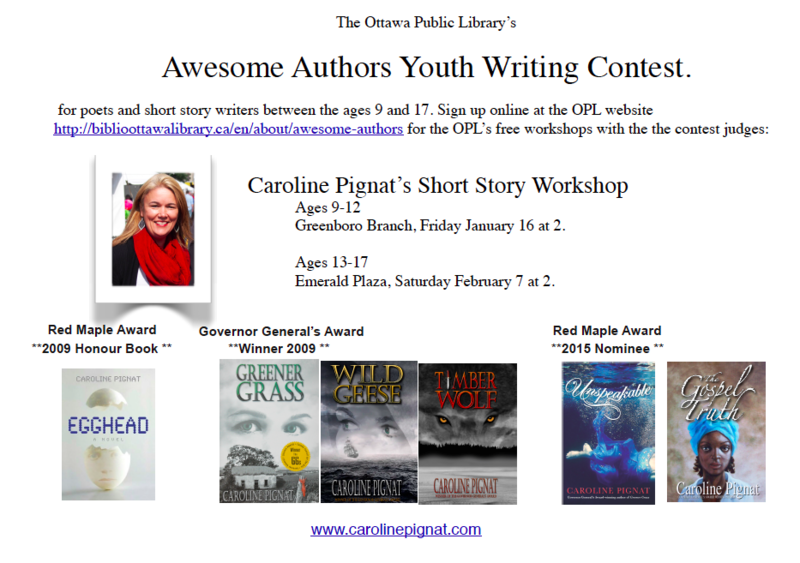 The Ottawa Public Library invites you to participate in the 19th annual Awesome Authors Youth Writing Contest, a contest for aspiring young poets and short story authors. Submissions will be accepted until February 16, 2015. Participants must have an OPL card. There is a limit of one (1) entry per person, per category. (i.e. English Poetry, English Short Story, nouvelle français et poésie français). No co-written entries will be accepted. Include one entry form per poem or story submitted. All winning entries will be checked for plagiarism*. Entries that are plagiarized, previously published or that do not follow guidelines will be disqualified. Submit your work online or in person at your local branch. If you choose to submit your work in person, please make 2 copies of your entry and drop by any branch to complete a submission form. If you do not receive confirmation that your entry has been received, please contact Sheri Riviere at Sheri.Riviere@BiblioOttawaLibrary.ca or 613-580-2424 x32163. Contest judges will be offering four English writing workshops and two French workshops to share their knowledge and experience with young authors. Local authors Caroline Pignat, Michel Lavoie and JC Sulzenko will judge the submissions. Celebrate the launch of Caroline Pignat's latest novel...get in the spirit of Christmas...and support a great cause. We are doing things a little differently for this launch. 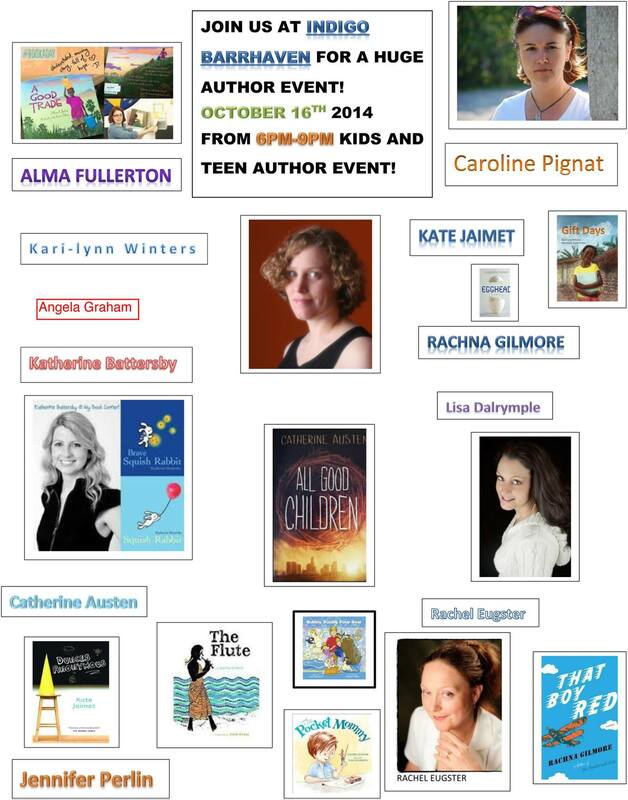 Caroline will be selling and signing her books at the All Saints Christmas Craft Fair -- a wonderful event with over 150 vendors. Admission is $1 or a canned good. Proceeds from Caroline's sales will be going towards Todo los Santos, a school sponsored by All Saints DR Experience Team and the All Saints community. All Saints HS 9-4 p.m.
Meet All Saints High School’s Dominican Experience Team: fifteen students and three teachers who travel to the Dominican Republic. 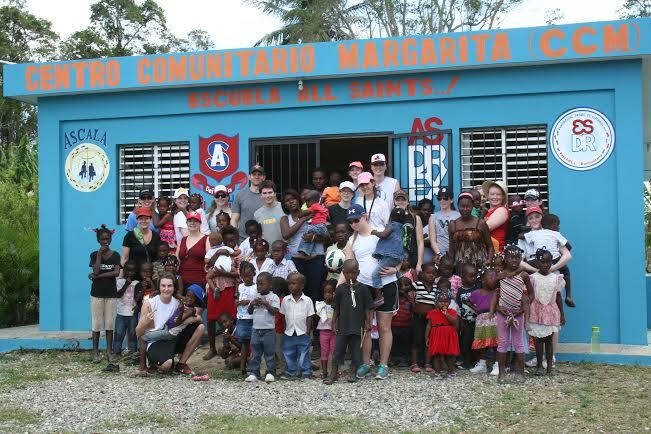 Each year, this new group of students visit the poorest places in the Dominican Republic. Traditionally a trip of experiential learning, the DR EX Team has become a cause as the group developed close relationships with their host families and strong bonds within the community in Batey Margarita. A community desperately in need of a school. Thanks to the vision and commitment of the All Saints DR EX Team and the ongoing support of the All Saints community, we are thrilled to share that about a year ago, Todo los Santos, a small one room school house in Batey Margarita, opened its doors. Named after its sister school in Kanata, Ontario, over forty children attend Todo los Santos. Without it, these children aged 2-6 would not receive any formal education. Born to Haitian parents, they are denied access to DR schools. The All Saints DR EX Team has three fundraisers, including the Cake Auction and a Live and Silent Auction. This not only funds Todo los Santos teacher salaries, school supplies, and building maintenance, each day the students receive a snack. For many, their only meal of the day. Recently, the All Saints DR EX Team funded the construction of a moveable wall which divides the school house into two classes. Current fundraising is now going toward providing each student with a school uniform.